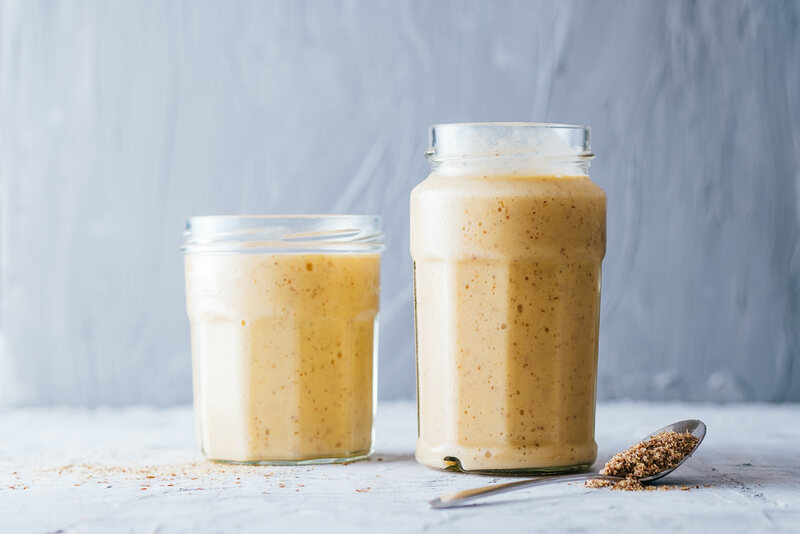 Well, this mango smoothie recipe is so simple it practically doesn’t need a whole blog post about it but the flavour is just so beautiful that I would feel selfish if I didn’t share it. This recipe came about as I am forever trying to get my little girl to have more calcium-rich foods in her diet. She is also not a fan of bananas unless I can sneak them into a smoothie so I decided to create a milk-based drink for her to have at breakfast time that was rich in vitamins and minerals. This smoothie is so delicate and creamy. The mixture of coconut and mango give it a really summery feel and it is very filling, making it the perfect choice for breakfast. So, a little bit about the nutrition. Aside from using fortified coconut milk which contains calcium, B12 and vitamin D the mango is a real powerhouse of nutrients. Just one cup of mango contains 76% of your daily vitamin C. On top of this it’s a rich source of B vitamins, vitamin A, copper, potassium and fibre. The humble banana adds to this concoction of goodness by offering a healthy source of potassium, vitamin B6, vitamin C, fibre, carbohydrates and various antioxidants and phytonutrients. Then to top this nutrient dense shake off are my favourite, flax seeds. They are a fantastic source of vegan Omega 3. They are loaded with fibre, calcium, iron and magnesium to name but a few! But the thing that makes them the show stopper for me is that they are the richest plant source of lignans. Lignans are polyphenols found in plants and are renowned as powerful antioxidants that can even help prevent cancer. There really is something special about finding a recipe that is so delicious yet equally matched in nutrition. I feel happy about giving my children this smoothie any time of the day and they absolutely love the taste. It has become a firm favourite in our household. It is perfect for a speedy breakfast option or a snack anytime of the day. Place all the items into your blender and top with the coconut milk. Add more milk if you prefer a looser smoothie and less if you want a smoothie bowl. You could shake up this recipe and add in even more goodness by adding in some green powders. For example wheatgrass powder or barley grass powder. You could even add in some oats to make a thick and creamy smoothie bowl. Top it with berries and coconut and you will have a fabulous smoothie bowl dessert! Let us know how you have your mango milk.